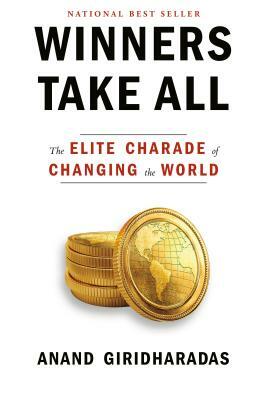 The New York Times bestselling, groundbreaking investigation of how the global elite's efforts to "change the world" preserve the status quo and obscure their role in causing the problems they later seek to solve. An essential read for understanding some of the egregious abuses of power that dominate today’s news. Former New York Times columnist Anand Giridharadas takes us into the inner sanctums of a new gilded age, where the rich and powerful fight for equality and justice any way they can--except ways that threaten the social order and their position atop it. We see how they rebrand themselves as saviors of the poor; how they lavishly reward "thought leaders" who redefine "change" in winner-friendly ways; and how they constantly seek to do more good, but never less harm. We hear the limousine confessions of a celebrated foundation boss; witness an American president hem and haw about his plutocratic benefactors; and attend a cruise-ship conference where entrepreneurs celebrate their own self-interested magnanimity. Giridharadas asks hard questions: Why, for example, should our gravest problems be solved by the unelected upper crust instead of the public institutions it erodes by lobbying and dodging taxes? He also points toward an answer: Rather than rely on scraps from the winners, we must take on the grueling democratic work of building more robust, egalitarian institutions and truly changing the world. A call to action for elites and everyday citizens alike. ANAND GIRIDHARADAS is the author of The True American and India Calling. He was a foreign correspondent and columnist for The New York Times from 2005 to 2016, and has also written for The Atlantic, The New Republic, and The New Yorker. He is an Aspen Institute fellow, an on-air political analyst for MSNBC, and a former McKinsey analyst. He teaches journalism at New York University and has spoken on the main stage of TED. His writing has been honored by the Society of Publishers in Asia, the Poynter Fellowship at Yale, and the New York Public Library's Helen Bernstein Award. He lives in Brooklyn, New York.